Hello there! 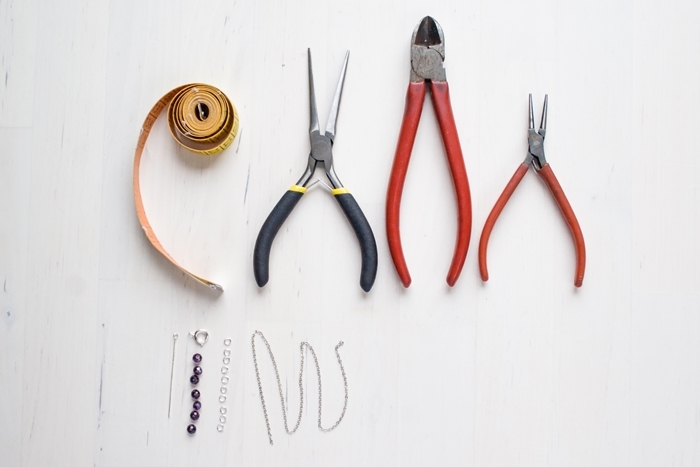 I'm back with a new fun jewelry project for you. I thought that my accessory stack was lacking a bunch of cute, summery bracelets that I could wear for pretty much any occasion and that would look good with most of my outfits. And this is what I came up with. 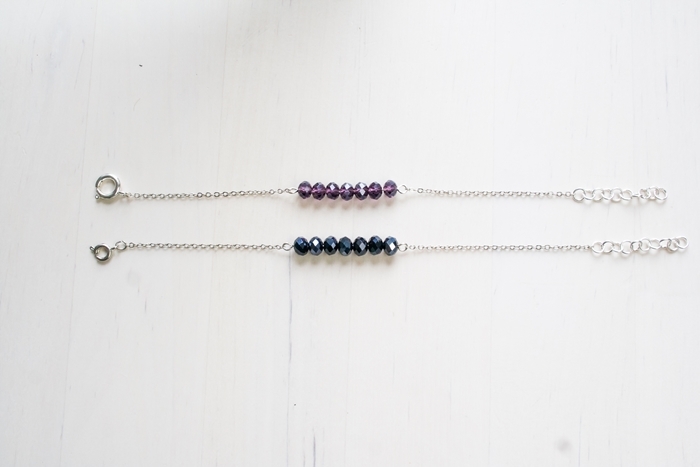 I love the light and delicate look these bracelets have about them and how the faceted glass beads reflect the light (sparkly!). And they're easy to make, too! I can imagine making a whole collection in different bead sized and different colors and combining them to match any outfit I have. Sounds good? 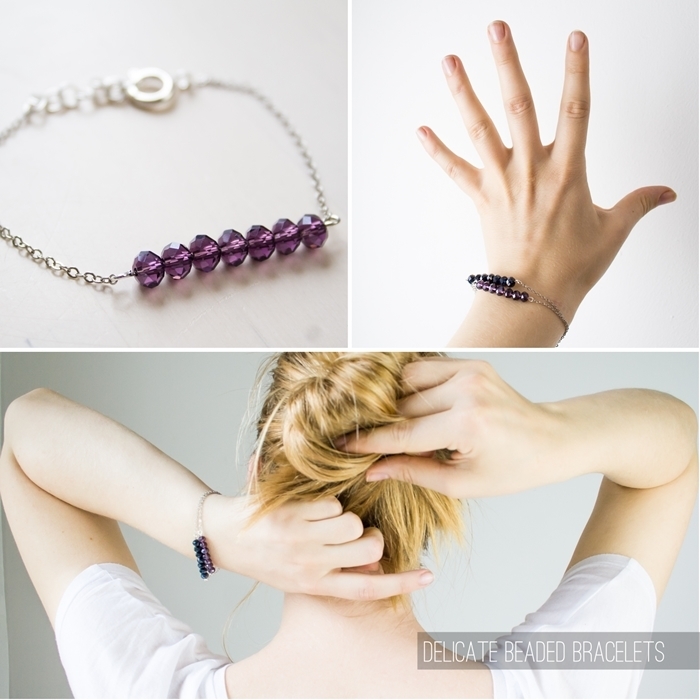 Join me and let's make a bunch of delicate beaded bracelets! 1. String the alphabet beads and any other beads onto an eyepin. Make sure there are about 1.5 cm left at the end to create a second eye. Make a second eye at the end of the pin. It's not that complicated but I would advise you to practice it a few times beforehand. To make an eye, grip the pin with the chain nose pliers right behind the last bead and bend the remaining pin into an 45° angle. Now make a loop with the round nose pliers until the end of the pin points downwards, cut away the excess wire using the sidecutter and maybe correct slightly with the chain nose pliers again. Here's also a nice video tutorial. 2. Measure your wrist. 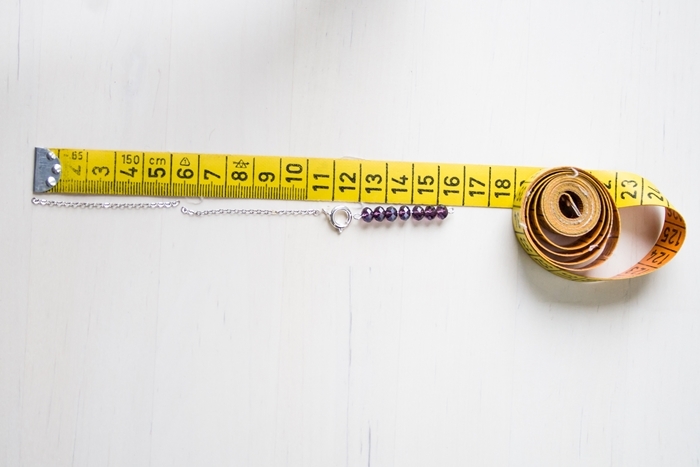 Then put the measuring tape flat onto a surface and put the eyepin and the clasp next to each other, starting at your wrist circumference and going downwards. 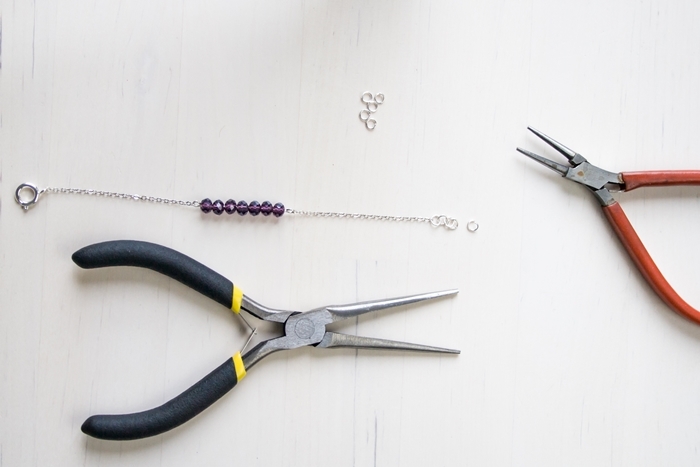 Cut a piece of chain as long as the remaining length and cut it in half. 3. Now we put the bracelet together. Start by threading a piece of chain onto each eye of the eyepins. You might have to open the eyes up a bit to get the chain on, but make sure to close them thoroughly again afterwards. 4. Add the clasp to the other end of one of the chains just like you did with the eyes in the step before. 5. The final step is to make the bracelet adjustable in length. To add a simple adjustable chain, just make a chain of 10 jump rings and combine it with the free end of chain. We're done! This is a quick and pretty easy project to do on a free afternoon. For you and for all of your friends. You can easily make a bunch! These also make pretty birthday gifts. Try gold chain and findings instead of silver for a warmer, sunnier look that's perfect for summer. these are adorable and would go so well with any outfit!! Hello, Kathie! I just love how they are made – minimalistic, and quite perfect for any outfit. We need more of this kind of style nowadays, as it speaks of quiet elegance and accentuates even a plain shirt. It is definitely a charmer. Thank you for sharing!